I recently learned about the site PaperBackSwap.com that allows you to swap books with others via mail. They have a nice system with some checks and balances that facilitate trust and honesty between traders. The site works on a credit system. When you sign up, if you immediately list 10 books you’re willing to trade, they give you 2 credits. Each credit allows you to receive one book. Audio books can also be traded and require 2 credits to receive. Every time you send a book you get a credit. You’re basically trading a book for a book. How does the shipping part work? Once someone requests one of your books you have two options. The first option is to go to the post office and send the book. Once the person receives the book, they login to the site and mark it as received and you get your credit. The second option is to use PaperBackSwap’s built in system to pay for the postage and print out the needed labels at home. Using this system allows you to avoid a trip to the post office since you can just drop the book in your mailbox. Using this system also gives you your credit immediately so you don’t have to wait for the person receiving the book to mark it as received to get your credit. There’s a small additional fee to use this service, but it’s typically less than a dollar and probably cheaper than paying for the gas to go to the post office. So far I’ve sent three books and have yet to request any. The selection of books posted looks decent, but not overly comprehensive. I found a few books I was interested in. If a book you want isn’t listed as available, you can reserve a copy and once someone has one available, you’ll be notified. The jury is still out for me on this site. I’ve spent an average of about $3.00 per book for each book I’ve sent. That’s less that half the price of buying a book new so if I end up getting some books I want through the service, I’ll consider it a success. If nothing else, it’s good to get rid of some books I no longer needs and reduce my clutter. PaperBackSwap also has two sister sites; one for trading CDs and one for trading DVDs. I haven’t looked at them closely yet, but assume they work on the same system. If you want to refresh your collections, take a look. Have any readers used these services? Let us know how you liked them in the comments. Given the tight economy it’s more important than ever to keep control over your finances. In our family, we’ve had to cut back on entertainment expenses. Now instead of paying a babysitter, we trade off babysitting with a neighbor. We’ve stopped eating out very much, and try to eat at home. It’s been a while since we’ve been to the movie theater and usually opt to rent a $1 Red Box movie instead. Cutting back has also affected how we spend money on our hobbies. Ok, I’ll be truthful; it’s cut back on how much I spend on hobbies. For example, I used to fly remote-control airplanes which is not a cheap hobby. With each outing I ended up spending $20-40 on parts after the plane crashed. To get started alone can run from $150 to upwards of $1,000. Needless to say I haven’t flown lately. Instead, I’ve found myself spending time on hobbies that are much more affordable. One such hobby is Geocaching. 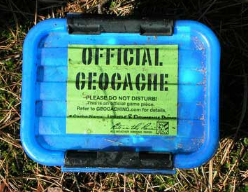 Pronounced jee-oh-kashing, Geocaching is like a modern-day treasure hunt. Someone hides a container, known as a “cache” (pronounced “cash”), anywhere in the world and then records the location using a GPS (Global Positioning Satellite) unit. He then logs in to the website Geocaching.com and uploads the coordinates. 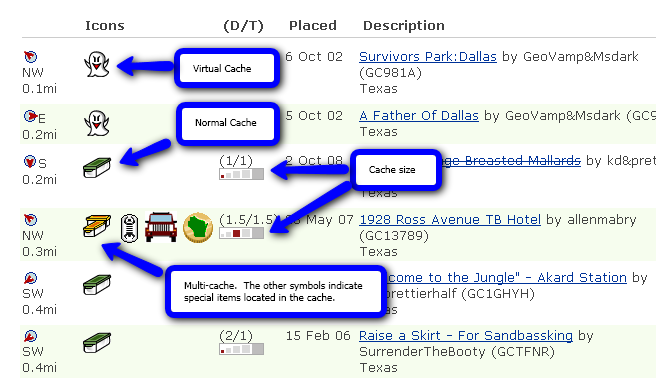 He can add a description of the cache and location or even add a theme or a quiz to the cache to make it more interesting. 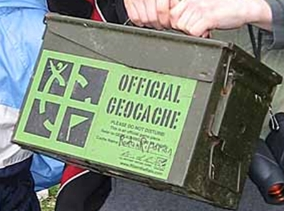 Once the cache is placed and the coordinates are uploaded, anyone can go to the geocaching.com website and search for caches they can find in their geographic area. Once you identify the caches you want to find, you can load the coordinates and description of the cache into your GPS unit or gps-enabled phone and set off on an adventure to find the cache. Once you find the cache you write your name in a log book located in the cache itself. If the cache container is large enough, there are typically a few trinkets placed inside as well. Geocaching etiquette dictates that you can take something from the cache as long as you leave something. It’s great for kids because it’s literally a modern-day treasure hunt. You never know what you’re going to find. When you get home after finding the cache you can then login to geocaching.com and record your find, thereby keeping track of your exploits. I personally have logged over 50 entries and I’m a novice. The more active participants have logged hundreds of finds. Where can you participate in geocaching? Although geocaching is still relatively obscure, I’ve been amazed at how many caches there are. Go ahead and test it yourself right now by entering your zip code at Geocaching.com and see how many results appear. Once the results appear, click on the “map it” link in the upper right hand side of the screen to see a map view of the caches. I’d bet that there are several caches within a couple miles of your home. In fact, there are possibly tens or hundreds within your city boundaries. While populated areas often have hundreds of caches, it’s also common to find them in the wilderness. 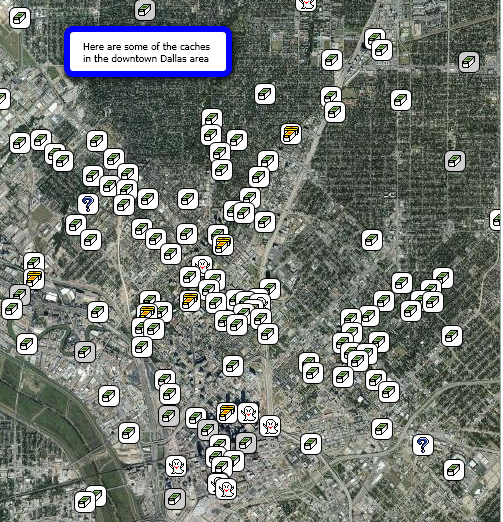 In fact, this is where more of the large-sized caches are found. Many people use geocaching as an excuse to exercise and get out in nature. What types of caches are there? What are they like? The cache containers range from extremely small (the size of a thimble or even smaller) to very large (the largest I’ve seen was an average-sized cooler). It’s common to see containers in the form of Altoids tins, small medicine bottles, ammo boxes, and Tupperware containers. Really small caches are known as “micro-caches” and can be located in even the most crowded urban areas without being noticed. There are also caches known as “virtual” caches where there’s no physical container. Instead you have to locate a landmark of some sort. It’s common for virtual caches to lead you to a historical marker or location. My favorite caches are “multi-caches” which consist of a series of caches that each give you a clue leading to the final cache. It’s like trying to solve a mystery or puzzle and can take several outings. Who typically participates in geocaching? There’s a pretty broad range of people who geocache including scouting groups, retirees who find it a good form of exercise, and families. I had a business colleague who would take his GPS unit on business trips and use geocaching as a way to familiarize himself with the area and its history. During one business meeting, the client was impressed with his knowledge of the area. The great thing is that you can get started geocaching for relatively cheap if not free. Many new smart phones have GPS functionality built in along with programs to map your position. In this case, no purchase is necessary. Otherwise, you’ll have to purchase a GPS unit. 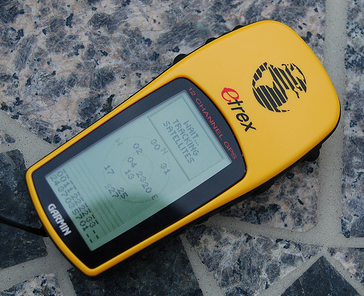 GPS units range in cost from around $50 to several hundred dollars. Last week I saw a very good GPS unit with mapping capabilities on sale for $100. While even the cheapest units will work, I recommend getting a unit with mapping capabilities. All but some of the cheapest units have maps built in. 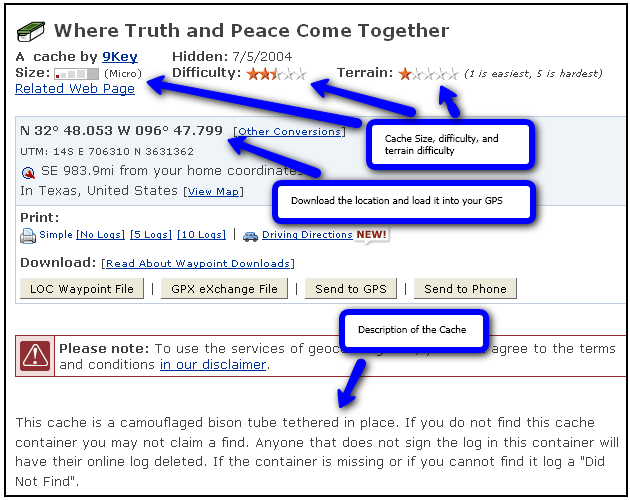 Once you have a GPS-enabled unit, you can go to geocaching.com and start searching for caches and logging your finds for free. Geocaching.com offers a subscription service for $30 a year or $10 a quarter that allows some advanced features such downloading multiple caches at once and sending automatic emails containing new caches in your area. I currently subscribe to the service and find it very useful. There is also software you can download to some smart phones that integrates with geocaching.com to instantly show nearby caches and with the built-in GPS functionality to show you the way. I used a trial version of the software on my Blackberry and found it very useful for impromptu caches when I felt the itch or had some spare time while traveling. On my particular phone I didn’t find the GPS to be quite as accurate as my stand alone unit, but the convenience made up for weaker accuracy. For some caches, I also found myself getting a little dirty and didn’t want to expose my phone to the elements. In such cases a stand-alone GPS unit may be better since they’re rugged and typically water-resistant. I recently checked out the geocaching website and saw that they have a new iPhone app. I must admit I was drooling over the satellite map integration and large interface. It looks like a very worthy iPhone application. One of the best things about Geocaching is building memories with others. I have vivid memories of the adventures I’ve been on while Geocaching with others. I’ve been with my son, friends, in-laws, and cousins. One particularly tricky multi-cache adventure took me and my brother-in-law from one side of Las Vegas to another. We probably covered 150 miles in one night. By the time we got to the last cache it was dark and we were in the middle of the desert trying to find the cache by flashlight. After about a 40 minute search, we finally found it. Good times. If you’ve tried Geocaching, leave a comment and tell us a story from your own adventures. 8 products that save you money, save the environment, and make life easier. I’m constantly on the look out for products that will make life easier and save money. The following list of products not only makes life easier and can save you money, but they can also help the environment. I remember seeing a Wal-Mart video that mentions if everyone bought and used one energy-saving light bulb, there would be a huge reduction in energy use. One small change if made by enough people can make a huge difference. 1. Motion Activated Wall switch. I’m a big fan of motion activated sensors. I use them anyplace that we use light in short bursts and then forget to turn them off; in our garage; in our pantry; in our walk-in closet. I’ve been tempted to put them in the bathroom but it’s harder to gauge how long to set the shut-off timer. I’m so used to walking into these places and just having the lights turn on automatically that when I go to someone else’s house I think there’s something wrong when the light doesn’t turn on. You can set the lights to go on anywhere from a few seconds to several hours, depending on the switch. I don’t necessarily have a favorite brand. As far as I know, they all perform about the same. If anyone’s had a particularly good or bad experience with a brand or model, please leave your thoughts in the comments. Cooper Wiring Devices motion sensor wall switch – This is the one I use. Here are some other brands of motion sensor wall switches. There is also a version made by First Alert you can plug directly into a light bulb socket that would be great for a garage or basement. 2. Motion Activated Electrical Outlet. I’ve never used one of these but, as you know, I’m a big fan of motion sensors. I would use this for lamps, fans, heaters, radios, or even power strips connected to electronics. 3. Motion-activated flood lights. Yes, another motion-activated product. We use these around the outside of our house; one on each side and two sets in the back. Not only are they great for conserving energy, they are also incredibly effective for burglary prevention. You couldn’t break into our house on any side without being in the spotlight. Here are several versions of outdoor motion sensor lights and floodlights. 4. Kill A Watt energy tracker. This device shows you how much energy other electronic devices use in kilowatt-hours. It can also monitor voltage, line frequency and power factors. I’m a little nervous getting one of these because I would spend too much time testing all our appliances. But that’s a good thing, right? By finding energy-guzzling appliances you can be more aware to use them conservatively or turn them off when not in use. A couple of common energy leaks are leaving electronics plugged in even when they’re not in use and leaving your computer turned on at night. Here is the “Kill A Watt” brand monitor. Here are monitors from several brands. 5. Renu-it battery charger. I go through a lot of batteries. My three-year-old boy loves trucks that make noises and take 4 C batteries. Add to that my extensive use of portable electronics and I go through batteries like crazy – AAs, AAAs, and Cs, you name it. I’ve used rechargeable batteries before but the cost of them is high and they wear out over time. The other problem is that batteries tend to disappear around my house and I don’t want expensive rechargeable batteries walking off. Enter the Renu-it battery charger. It charges regular alkaline, titanium, and rechargeable batteries safely. It has built-in mechanisms to prevent overcharging, overheating, and short-circuits. I’ve never used this product but I love the idea. This is definitely on my shopping list. 6. Valve cap pressure indicators. Not all the products on this list are for electronic devices. These clever units replace the existing valve caps on your car tires and constantly show the tire’s pressure making it easy to know when to add a little air. According to the EPA, you can improve your car’s gas mileage by more than 3 percent simply by keeping its tires inflated to the proper pressure. In addition, keeping tires inflated properly can extend the life of your tires so you’re saving money in more than one way. Keeping your tires properly inflated is also safer since under-inflated tires are less responsive, particularly in the rain and snow. One word of warning: a few Amazon reviews indicated that some defective valve caps may cause the tires to leak slowly. Analog Tire Pressure Valve Caps. Electronic tire pressure valve caps that blink when your tires are low. 7. MagLite LED bulb-replacement kits. It’s now common knowledge that LED lights use a small portion of the energy of regular incandescent lights and last way longer. LED lights are increasingly common in flashlights, electronics, and are even available as replacements for household light bulbs. These clever kits allow you to replace the bulb in a Maglite flashlight with an LED or luxeon light bulb. Most people I know have a number of old Maglites lying around. Now they can be updated and brought into the 21st century at about half the price of a new Maglite. Conversion kit for AA Mini Maglites. Conversion kit for C and D cell Maglites. 8. Energy-saving light bulbs (LED or florescent). According to one Fast Company article compact fluorescent light bulbs emit the same light as classic incandescents but use 75% or 80% less electricity. Florescent bulbs are now commonly sold at major retailers. Another benefit is that the bulbs are supposed to last much longer, even for several years. Over the lifetime of the bulb you will easily save more money than you paid for the bulb. We use florescent bulbs in several places in our house. I must admit I don’t like the light they produce as much as incandescent bulbs, but the right color lamp shade can remedy that for the most part. Less common (and much more expensive) are LED household light bulbs. There are currently LED bulbs available on the market but they are still too high priced for most consumers. I’m anxious to see what kind of light LED bulbs produce in a household light. Here are a variety of fluorescent blubs including regular sized bulbs and floodlights. Here are a couple of LED lights including a small version and a floodlight version. They didn’t get very good reviews and are quite expensive. It looks like LED technology isn’t quite ready to invade household lighting. This is an excellent Fast Company article outlining the benefits of CFL bulbs and how Wal-Mart has led a campaign to get consumers to start converting to CFLs. Well worth a read. Do you know of any other energy-saving or money-saving products? Leave them in the comments below!